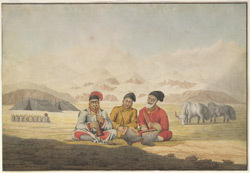 Watercolour by Hyder Young Hearsey (1782-1840) of an encampment at Gartok in Tibet, now in China, dated 21st July 1812. This view shows snowy mountains in the background with two tents, goats and two yaks in the middle distance. Three musicians are seated in the foreground, one is playing an hautboy, one on 'tablas', and the third singing and clapping his hands. This image was taken while Hearsey accompanied William Moorcroft on an expedition to discover the source of the Ganges. He had formerly accompanied Lieutenant Webb and Captain Raper on an earlier expedition in 1808. Moorcroft and Hearsey wanted to visit the sacred lake of Manasarowar as it had formerly been considered the source of all the sacred rivers of India. They also wanted to seek out prospective trade routes and study the Cashmere or shawl-wool goat and bring back some examples of woollen cloth. Moorcroft's account of the expedition was published in volume xii of Asiatick Researches, 1818. He wrote, "July 21st.---At about ten o'clock we were visited by three Tatar musicians from Latak...The airs were very similar to those of the Scotch; and the tones of the hautboy resembled strikingly those of the bagpipe...The musicians began with with an overture not unlike that of Oscar and Malvina, as far as comparison may hold between the execution from two instruments, and that of a full band. They then sang the words without music, and so went on with the instrumental and vocal performance alternately."